Le Jardin Needlework Accessories [C5609] - $10.00 : Yarn Tree, Your wholesale source for cross stitch supplies. Cross stitch pattern by JBW Designs. 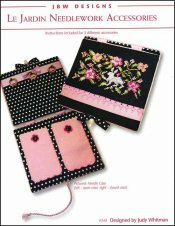 "Le Jardin Needlework Accessories," includes instructions for 3 different accessories. The first design is the needle case, which features beautiful pink, peach & white blooming flowers with a bunny in the middle. The second design is for the scissor sheath, which features a smaller scale design of the needle case, with beautiful blooming flowers & a bunny. The third design for the scissor fob, features one bright pink flower in the middle. A simply beautiful design to stitch for a friend or mom. Stitch count for the needle case is 66W x 34H. Stitch count for the scissor sheath is 39W x 49H. Stitch count for the scissor fob is 18W x 12H. All three designs are stitched on #8006 Zweigart Belfast Linen Black 32ct.